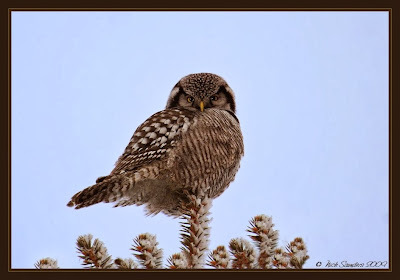 It's amazing how he's perched on that little pine branch sticking up and giving the coy look! Beautiful photo once again! What a cutie! He must be very light to not bend the branch. What a wonderful picture, Nick. Thank you for sharing your world! Fantastic capture it looks to me like he is givibg you the eye !! It's almost like one of those games where the wrong head is on the wrong body? He's a cool looking dude! What a beautiful photo of a beautiful subject. I have not seen one of those before. An excellent capture of a beautiful bird. He's perfect - so is the sharp-shinned below. Awesome shot with a flash well used. What a great shot that cute little fella Nick! I was hoping to see the one in Regina but alas it was not to be.Even pulled my camera out for the second time this Winter. Thanks guys. Sorry you missed the one right on your doorstep Rock.